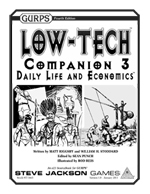 GURPS Low-Tech is a mighty tome in its own right, but in order to really get into the nooks and crannies of the worlds of TL0-4, the authors generated three additional bundles of knowledge: the Low-Tech Companion series. The first, Philosophers and Kings, revealed the tools the leaders of yesteryear used to maintain their position. The second, Weapons and Warriors, equipped the low-tech fighter with his tools of the trade -- and gave him optional rules for customizing them! The third entry was just released last week. Daily Life and Economics covers the day-to-day world of the past. After all, your adventurers can't be slaying dragons every day. Some days they'll need to help out their local blacksmith -- that new sword won't forge itself, but Low-Tech Companion 3 will help you figure out how long it will take. If the party just "found" a huge pile of treasure, how is it going to get back to their base? Check out the rules for hauling and shipping those sacks of gold and magical thrones in chapter 7.
e23 also released another issue of that window to the '80s, Space Gamer. #54 has all the regular features you've come to expect, and articles on Star Fleet Battles, The Fantasy Trip, and Wizard's Realm. After all, those who ignore the history of their hobby are doomed to repeat it!